USS George Washington (CVN-73) is a United States Navy nuclear-powered aircraft supercarrier, the sixth carrier in the Nimitz class and the fourth US Navy ship named after George Washington, the first president of the United States. She was built by Newport News Shipbuilding and was commissioned on 4 July 1992. George Washington (commonly known as GW) is 1,092 ft (333 m) long, 257 ft (78 m) wide and 244 feet (74 m) high. The super carrier can accommodate approximately 90 aircraft and has a flight deck 4.5 acres (18,000 m²) in size, using four elevators that are 3,880 ft² (360 m²) each to move planes between the flight deck and the hangar bay. With a combat load, GW displaces almost 97,000 long tons (99,000 t) and can accommodate 6,250 crewmembers. Her four distilling units can make 400,000 U.S. gallons (1,500,000 L) of potable water a day; the food service divisions serve 18,000 meals per day. There are over 2,500 compartments on board requiring 2,520 refrigeration tons (8.6 MW) of air conditioning capacity (enough to cool over 2,000 homes). The warship uses two Mark II stockless anchors that weigh 30 tons[vague] each, with each link of the anchor chain weighing 360 pounds (160 kg). It is currently equipped with two 20 mm Phalanx CIWS mounts and two Sea Sparrow SAM launchers. One CIWS and one Sea Sparrow mount were removed to make way for two RIM-116 Rolling Airframe Missile launchers, installed during the 2005 Drydocking Planned Incremental Availability (DPIA). Traditionally, U.S. Navy aircraft carrier hangar bays were painted Navy Gray; George Washington was commissioned with the hangar bay bulkheads and overhead painted white, to make the hangar bay appear larger and brighter. Since then, all U.S. carriers have followed suit. General Washington had long been a proponent of a strong Navy. On 15 November 1781 he wrote, “Without a decisive Naval force, we can do nothing decisive. And with it, everything honourable and decisive.” These words are engraved on a plaque on the ship’s quarterdeck. The ship can reach speeds of over 30 knots (56 km/h; 35 mph) and is powered by two Westinghouse A4W nuclear reactors that turn four 5-bladed screws of 66,220 pounds (30,040 kg) each. George Washington can travel more than 3,000,000 nautical miles (5,600,000 km; 3,500,000 mi) before needing refueling. The contract for the USS George Washington was awarded to Newport News Shipbuilding on 27 December 1982. The keel was laid on 25 August 1986. The ship was christened on 21 July 1990 by First Lady Barbara Bush, and was commissioned at Naval Station Norfolk on 4 July 1992. In 1993, following a fleet reorganization, the Cruiser-Destroyer Group 2 staff went aboard a new flagship, George Washington. In 1994 the group was under the command of Rear Admiral Alexander Krekich. The group participated in the 2000 NATO Exercise Destined Glory, Operation Joint Endeavor, Operation Deny Flight, Operation Southern Watch, and Operation Vigilant Resolve. After 2001 the group took part in Operation Enduring Freedom and Operation Iraqi Freedom. In 1997 Commander Cruiser-Destroyer Group 2, Rear Admiral Michael Mullen, led the group on deployment from George Washington. On 20 February the USS George Washington entered the Gulf of Aden, and a week later was conducting operations in the Persian Gulf. On 28 January 2005 the ship entered shipyard for Drydocking Planned Incremental Availability (DPIA). Many ship’s systems were upgraded and maintenance was done to the hull. The ship’s four jet blast deflectors were removed and upgraded to handle the increased heat generated by the F/A-18E/F Super Hornet. One defensive Phalanx CIWS mount and one Sea Sparrow launcher were replaced by two Rolling Airframe Missile launchers. During the 11 months the ship was drydocked, the crew contributed 20,000 hours of volunteer community service to the city of Newport News, Virginia. The work was completed on schedule, and USS George Washington returned to her Norfolk home port on 17 December 2005. Washington personnel carry injured personnel across the ship’s flight deck after four personnel were rescued from the burning merchant fishing vessel, Diamond Shoal. On 1 December 2005, the United States Navy announced that George Washington would replace Kitty Hawk as the forward-deployed carrier at the U.S. Yokosuka Naval Base in Japan, becoming the first nuclear-powered surface warship permanently stationed outside the continental U.S. In an attempt to explain the carrier’s mission to the Japanese public, the U.S. Navy printed a manga about life aboard GW, titled “CVN-73”. GW and CVW-17 left Norfolk on 4 April for a scheduled two-month deployment to operate as part of SOUTHCOM’s “Partnership of the Americas”. This deployment included counter-drug operations in the Caribbean Sea, crew exchanges and exercises with Latin American and South American navies, and port visits for the carrier and strike group, which consisted of the cruiser Monterey, the destroyer Stout, and the frigate Underwood. The first of these port visits took place from 14–17 April in St. Maarten, and Antigua from 15–18 May. GW returned to Norfolk on 24 May. 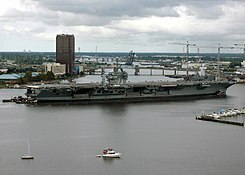 On 7 April 2008 George Washington, with CVW-17 and Carrier Strike Group 8 embarked, departed Norfolk en route to Yokosuka, Japan to replace Kitty Hawk, taking a route around South America as she is too large for the Panama Canal; she took part there in the Gringo-Gaucho maneuvers with Argentine Naval Aviation. After the planned turnover with Kitty Hawk at NS Pearl Harbor, Hawaii, CVW-17 and Carrier Strike Group Eight were to return to their home ports in the U.S. to be replaced by Carrier Air Wing 5, based at Naval Air Facility Atsugi, and Carrier Strike Group Five based at Yokosuka Naval Base in Yokosuka, Japan. During the South American transit, the George Washington Battle Group participated in U.S. Southern Command exercises Partnership of the Americas and Unitas, a joint military exercise between the United States, Brazilian and Argentine navies. On 22 April 2008, George Washington arrived in Rio de Janeiro, Brazil, for her first port visit to that country. The ship traversed the Strait of Magellan on 9–10 May. 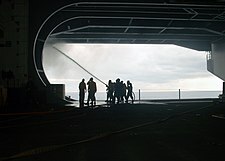 On 22 May 2008, while the ship was off the Pacific Coast of South America, a fire broke out and injured 37 sailors, with no fatalities, in an incident described by the Navy as “serious”. According to a statement from Naval Air Forces’ public affairs office, the fire broke out in the ship’s air-conditioning and refrigeration space and an auxiliary boiler room. The fire spread via a cableway and ventilation ducting and caused extreme temperatures in some parts of the ship. It took over twelve hours for the crew to contain and extinguish the fire, one of the largest non-combat fires aboard a U.S. Naval vessel since the devastating fire on board USS Forrestal in 1967. On 27 May George Washington stopped at NAS North Island in San Diego, California for repairs. On 20 June the Navy announced that the damage from the fire was more serious than previously thought, and that repairs would take at least until August and would cost $70 million. As a consequence, Kitty Hawk was retained in Hawaii during June and July to replace Washington in the RIMPAC 2008 exercises, with the planned turnover to take place in San Diego instead of Hawaii. On 30 July 2008 Willard announced that Captain David C. Dykhoff had been relieved of his duties as Commanding Officer citing “a loss of confidence in his ability to command and his failure to meet mission requirements and readiness standards.” Executive Officer Captain David M. Dober was also relieved for “substandard performance.” Six other sailors were disciplined with non-judicial punishment. Four sailors were found guilty of violating a lawful order and hiding hazardous materials in direct violation of safety regulations. The Navy’s Pacific Fleet refused to name the enlisted sailors disciplined. Two non-commissioned officers were found guilty of negligence and dereliction of duty for not properly supervising the workspace. The Navy and Marine Corps Medal was awarded to Senior Chief Petty Officer Keith Hendrickson for leading a team that rescued four shipmates trapped by the fire deep in the interior of the ship. On 21 August, under new skipper Captain J.R. Haley and executive officer Captain Karl O. Thomas,George Washington departed NAS North Island for Japan, with Carrier Air Wing Five (CVW 5) embarked. 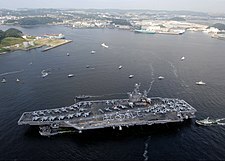 The carrier arrived at Yokosuka, Japan on 25 September 2008, where she was met by several hundred local supporters and protesters. In June 2009 the Navy revealed that 15 of the carrier’s sailors were being expelled from the service for use of illegal designer drugs. On 2 July 2009 George Washington, accompanied by USS Cowpens, anchored on the Gage Roads of Perth. GW sailors visited Fremantle and Perth. Local brothels recruited extra staff to cope with the increase in business. Crew members volunteered to complete community projects including cleaning, maintenance, and painting at organizations including PMH, a Salvation Army rehabilitation center, Perth Zoo and Cohunu Koala Park. In mid-July the ship took part in Operation Talisman Sabre off the coast of Australia’s Northern Territory. From 2 to 6 August 2009 GW made a port call in Singapore where sailors were granted rest and recreation leave and participated in community relation projects such as painting and landscaping at a local community center, children’s center, special education school and an association for the disabled. The ship made a 4-day goodwill visit to Manila Bay, Philippines, anchoring off historic Corregidor Island from 11 to 15 August 2009. In August 2009 George Washington participated in the Indonesian Fleet Review, during Sail Bunaken 2009 event, in North Sulawesi, Indonesia. The parade of warships and tall ships from 40 nations included five from the George Washington Carrier Strike Group, including George Washington, Cowpens, Mustin, McCampbell, and Fitzgerald. Carrier Airwing Five, currently embarked on George Washington, also participated with a multi-aircraft fly-by of the viewing station during the parade. The George Washington Carrier Strike Group returned to Japan 3 September for a maintenance upkeep period prior to her second fall patrol. On 29 October George Washington docked at Hong Kong to resupply and stayed for four to five days. On 11 May 2010 George Washington completed maintenance and refit and departed Yokosuka for trials. On 21 July 2010 she arrived at Busan, South Korea for a port visit and then participated in exercise Invincible Spirit in the Sea of Japan with the USAF, Republic of Korea Air Force and Republic of Korea Navy from 25 to 28 July 2010. Invincible Spirit was staged to improve combined operations capability and as a show of deterrence following the ROKS Cheonan sinking. The exercise was conducted in the Sea of Japan to placate China’s objections to military exercises being conducted in the Yellow Sea. Due in part to those objections a second exercise, in the Yellow Sea on the west coast of North Korea, was planned. On 8 August 2010 George Washington stopped off the coast of Da Nang City in the South China Sea to celebrate the 15th anniversary of normalization of Vietnam-US diplomatic relations, the first Vietnam visit by a U.S. aircraft carrier since the Vietnam War. In November 2010 the George Washington carrier group departed for planned exercises with the Republic of Korea Navy, partially in response to the shelling of Yeonpyeong and increased tension with North Korea. George Washington was one of several ships participating in disaster relief after the 2011 Tōhoku earthquake and tsunami. While docked for maintenance in Yokosuka she detected radiation from the Fukushima I nuclear accidents, and was ordered to leave port before schedule, with a smaller-than-normal crew, to avoid the radioactive plume. The smaller crew was unable to continue to provide aid. While at sea, the carrier made two visits to United States Fleet Activities Sasebo to exchange crew members and take on maintenance equipment. The ship returned to her berth at Yokosuka on 20 April 2011. A 2011 proposal by Senator Tom Coburn called for the decommissioning of George Washington in 2016, before beginning her refueling and complex overhaul but after the carrier Gerald R. Ford enters service. After redeploying on another training cruise, a 25 September 2011 video from the carrier uploaded to YouTube became a viral hit. In the video, two flight deck crewmen are almost hit by a landing F/A-18, which is waved-off shortly before landing on the deck where the crewmen are walking. On 22 November 2011 George Washington returned to Japan to conclude her 2011 patrol, with four port visits and two major exercises while cruising more than 50,000 nautical miles across the western Pacific Ocean. 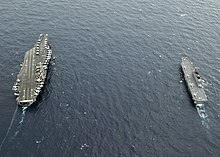 During George Washington deployment, the aircraft carrier participated in joint training exercises with other service branches and regional partners, visited three Asia-Pacific nations (South Korea, Hong Kong, Malaysia) to practice interoperability, and conducted dual-carrier operations with John C. Stennis. On 8 February 2013 the U.S. Department of Defense announced that the scheduled mid-life complex overhaul for the carrier Abraham Lincoln would be postponed pending the resolution of the upcoming budget sequestration. The budget shortfall would affect Lincoln‘s refueling of her nuclear propulsion plant, the next scheduled mid-life complex overhaul involving George Washington forward-based in Yokosuka, Japan, and the de-fueling of the recently deactivated nuclear-powered Enterprise.GW and her support vessels visited Brisbane, Australia in July. The ship moored 4 October 2013 in Busan, South Korea for a regularly-scheduled liberty port visit. In November 2013 she moored in Victoria Harbour, Hong Kong. On 11 November 2013 George Washington and her carrier strike group were deployed for a humanitarian mission in the Philippines, Operation Damayan, after destructive Typhoon Haiyan. The carrier group arrived on 14 November, delivered relief supplies, and deployed aircraft for search and rescue missions. On 6 December 2013, George Washington returned to her forward-deployed port of Fleet Activities Yokosuka, Japan. In January 2014, it was announced that George Washington would be replaced by Ronald Reagan at Yokosuka when the ship’s Refuelling and Complex Overhaul is due. As part of the Navy’s FY 2015 budget, Pentagon officials hinted at the possibility of taking George Washington out of service due to budget reductions. The ship is due for her mid-life refueling and overhaul in 2016, which will take three years and cost over $3 billion. The decision to replace George Washington with the newer Ronald Reagan in her area of operations near Japan means decommissioning the ship would not affect American carrier presence in the region. The Congressional Budget Office has found that the elimination of the carrier and the air wing would save $7 billion from 2016 to 2021. They also found that the cost of decommissioning would be $2 billion, but spread out through 2021. After 2021, George Washington would return to service and remain operational[inconsistent] until its planned out of service date in 2042.Nimitz is the oldest ship in the class and would be expected to be decommissioned early instead of George Washington. However, Nimitz has undergone a mid-life refuelling and is not due for decommission until the mid 2020s, whereas George Washington has yet to undergo this procedure, providing an opportunity to remove the ship from service before the planned expenditure. In February 2014, under pressure from Congress, the Obama administration was reported to have decided to request additional funds from Congress for the refueling. However, if sequestration is not repealed by 2016, the Pentagon may not be able to find funding to keep George Washington operating and it may have to be retired. In the draft of the Navy’s unfunded priorities list for FY 2015, a $796 million line item was included for the Refueling and Complex Overhaul (RCOH) of USS George Washington. Before it was approved by the Pentagon and sent to Congress, it was vetted by the Office of the Secretary of Defense (OSD) and signed by Chief of Naval Operations Jonathan Greenert, after which the line item was removed. In a 31 March 2014 letter to Congress, Admiral Greenert said that the decision to remove the RCOH line item from the unfunded priorities list was made to align with budget decisions over the next several years. The list was for the FY 2015, so a decision to refuel or inactivate the carrier has to be made during FY 2016 budget planning with the fiscal outlook at that time and the possibility of sequestration funding levels. The removal of the line item removes funding for advanced procurement of materials for the overhaul; another line item had funding to remove the fuel from the ship, but not to overhaul or refuel it. By July 2014, the Navy had decided it would find the $7 billion in funds needed to keep George Washington in service. This was followed by three congressional marks to fund the Refueling and Complex Overhaul if the Navy would not provide funding in the FY 2015 budget. As of July 2014, the Navy was still awaiting the fate of sequestration and the moving of funds to refueling the ship puts pressure on other programs. The Navy’s FY 2016 budget funds nuclear refueling and overhaul of George Washington. George Washington departed Japan in May 2015 to participate in Exercise Talisman Sabre 2015 with Australia and New Zealand. She arrived at Naval Air Station North Island on 10 August. In San Diego, George Washington conducted a 10-day turn over period with Ronald Reagan before leaving the Southern California operating area for Naval Station Norfolk, where the ship is expected to begin mid-life RCOH at Newport News Shipbuilding, Huntington Ingalls Industries in fall 2016. George Washington deployed in October 2016 to Haiti to provide support after Hurricane Matthew, along with USNS Comfort and USS Mesa Verde. On December 21, George Washington pulled into port in Norfolk, VA. In January 2017 it will being preparations for a complete overhaul, which will officially begin in August 2017 and is expected to last 4-5 years. uss george washington :Polmar, Norman (2004). The Naval Institute guide to the ships and aircraft of the U.S. fleet. Naval Institute Press. p. 112. ISBN 978-1-59114-685-8. USS George Washington : “USS George Washington (CVN-73)”. NavSource Online. NavSource Naval History. 18 February 2007. Retrieved 11 January 2015. USS George Washington : “USS George Washington CVN-73″. U.S. Carriers: History and deployments. 11 August 2010. Retrieved 2009-04-20. USS George Washington : “USS George Washington to Replace USS Kitty Hawk as U.S. Navy’s Forward Deployed Carrier”. United States Navy. 2 December 2005. Archived from the original on 25 October 2006. USS George Washington : Stokky. “U.S. Navy Manga Set To Invade Japan”. Animekon. Retrieved 11 January 2015. USS George Washington : “USS George Washington Departs”. United States Navy. 7 April 2008. Retrieved 11 January 2015. USS George Washington : Starr, Barbara (23 May 2008). “Sailor treated for burns after fire on carrier”. CNN. Retrieved 11 January 2015. USS George Washington : “USS George Washington Stops in San Diego to Repair Fire Damage”. SanDiego6. 27 May 2008. Archived from the original on 11 December 2008. Retrieved 27 May 2008. USS George Washington : Liewer, Steve (21 June 2008). “Damaged aircraft carrier to stay in port for repairs”. San Diego Union-Tribune. Retrieved 11 January 2015. USS George Washington : Kakesako, Gregg K. (4 July 2008). “Kitty Hawk remains in Hawaii for RIMPAC”. Honolulu Star-Bulletin. Retrieved 11 January 2015. USS George Washington : Liewer, Steve (7 October 2008). “Crew Faulted In Blaze On Carrier”. San Diego Union-Tribune. Retrieved 15 January 2015. USS George Washington : “U.S. fires captain of Japan-bound nuclear warship”. Reuters. 30 July 2008. Retrieved 11 January 2015. USS George Washington : Eisman, Dale (31 July 2008). “Two Top Navy Officers Fired Over $70 Million Carrier Blaze”. Norfolk Virginian-Pilot. USS George Washington : “USS George Washington Investigation Complete, Senior Leadership Relieved”. United States Navy. 30 July 2008. Retrieved 11 January 2015. USS George Washington : Tritten, Travis B. (29 August 2008). “Sailors Disciplined For Roles in Fire Aboard George Washington”. Stars and Stripes. USS George Washington : Wiltrout, Kate (17 October 2009). “Sailor Receives Medal, Honoring Him For Saving Shipmates”. Norfolk Virginian-Pilot. USS George Washington : From USS George Washington Public Affairs (21 August 2008). “USS George Washington Departs for Japan”. United States Navy. Retrieved 11 January 2015. USS George Washington : “George Washington Arrives Sept. 25”. Kyodo News. Japan Times. 13 September 2008. USS George Washington : Slavin, Erik (3 July 2009). “Navy to separate 15 sailors in drug probe”. Stars and Stripes. Retrieved 11 January 2015. USS George Washington : “Brothels put on staff for US navy”. 3 July 2009. Archived from the original on 10 July 2010. USS George Washington : Cardy, Todd (5 July 2009). “5000 US sailors on USS George Washington prepare for Perth”. PerthNow. Archived from the original on 5 July 2009. USS George Washington : “Indonesian Fleet Review 2009”. USS GW Official Website. 18 August 2009. USS George Washington : “U.S. Aircraft Carriers Stopped over in Hong Kong”. Shenzhen Post. 29 October 2009. Retrieved 11 January 2015. USS George Washington : Kyodo News, 11 March 2010. USS George Washington : Jung, Sung-ki (20 July 2010). “F-22 Raptor to join naval drill in Korean seas”. The Korea Times. Retrieved 11 January 2015. USS George Washington : Pomfret, John (30 July 2010). “U.S. takes a tougher tone with China”. The Washington Post. Retrieved 11 January 2015. USS George Washington : Mason, Margie (8 August 2010). “Former enemies US, Vietnam now military mates”. USA Today. Retrieved 11 January 2015. USS George Washington : Dogyun, Kim; Steward, Phil (24 November 2010). “U.S. aircraft carrier heads for Korean waters”. Reuters. Retrieved 11 January 2015. USS George Washington : Sanger, David E.; McDonald, Mark (23 November 2010). “South Koreans and U.S. to Stage a Joint Exercise and sometime in the year, the GW visits the Thai Sattahip Navy Base.”. New York Times. Retrieved 27 November 2010. USS George Washington : “Warships Supporting Earthquake in Japan”. Seawaves. Archived from the original on 23 March 2011. USS George Washington : “Agency: Damaged container may be causing smoke, radiation spike”. CNN. 16 March 2011. Retrieved 11 January 2015. USS George Washington : Lawerence, Chris (22 March 2011). “U.S. military considers mandatory evacuations in Yokosuka, Japan”. CNN. Retrieved 11 January 2015. USS George Washington : “Carrier returns to Yokosuka as concerns ease”. Kyodo News,. Japan Times. 21 April 2011. Retrieved 11 January 2015. USS George Washington : “Reducing the Deficit: Spending and Revenue Options”(pdf). Congressional Budget Office. p. 106. USS George Washington : Slavin, Erik (6 October 2011). “Sailors won’t face discipline for close call with fighter jet, Navy says”. Stars and Stripes. Retrieved 11 January 2015. USS George Washington : “| MENAFN.com”. menafn.com. Retrieved 2014-02-20. USS George Washington : “Lack of Funding Affects USS Lincoln Refueling and Complex Overhaul”. NNS130208-17. Defense Media Activity — Navy. 8 February 2013. Retrieved 11 January 2015. USS George Washington : “George Washington Bids Farewell to “The Land of Morning Calm””. USS George Washington Public Affairs Office. Facebook. USS George Washington : MacLeod, Calum (14 November 2013). “Filipinos without food, water for days see aid arrive”. USA Today. Retrieved 11 January 2015. USS George Washington : “George Washington Strike Group Completes 2013 Patrol”. USS George Washington Public Affairs Office. Facebook. USS George Washington : “Reagan replacing Washington in Japan”. CNN. 15 January 2014. Retrieved 11 January 2015. USS George Washington : Cavas, Christopher P. (26 January 2014). “Carrier cut could be back on table”. Militarytimes.com. Retrieved 11 January 2015. USS George Washington : Freeburg Jr., Sydney J. (28 January 2014). “The Navy’s Carrier Crunch: Even Without Budget Cuts, Deployments Will Drop”. Breakingdefense.com. Retrieved 11 January 2015. USS George Washington : “Pentagon drops plan to retire USS George Washington”. Stars and Stripes. 7 February 2014. Retrieved 11 January 2015. USS George Washington : Osborn, Kris (26 February 2014). “Carrier Fleet Still Vulnerable to Sequestration”. Military.com. Retrieved 11 January 2015. USS George Washington : LaGrone, Sam (3 April 2014). “Navy: Decision to Pull Unfunded Carrier Refueling Request was CNO’s Choice”. USNI.org. Retrieved 11 January 2015. USS George Washington : LaGrone, Sam (10 July 2014). “Stackley: Navy Plans to Refuel Carrier George Washington”. USNI.org. Retrieved 11 January 2015. USS George Washington : Kreisher, Otto (2 February 2015). “Navy 2016 Budget Funds V-22 COD Buy, Carrier Refuel”. Breakingdefense.com. Retrieved 18 May 2015. USS George Washington : [George Washington to Arrive in San Diego, Three Carrier Swap Continues http://www.navy.mil/submit/display.asp?story_id=90522], Story Number: NNS150807-10 from Naval Air Force Pacific Public Affairs, 7 August 2015. This is video footage of President William Jefferson Clinton delivering remarks to the crew of the U.S.S. George Washington in Portsmouth, United Kingdom. This footage is official public record produced by the White House Television (WHTV) crew, provided by the Clinton Presidential Library. This material is public domain, as it is a work prepared by an officer or employee of the U.S. Government as part of that person’s official duties. Any usage must receive the credit “Courtesy; William J. Clinton Presidential Library,” and no exclusive rights or permissions are granted for usage. Looking for other Supercarriers? Check those pages!